Cn 159 Klondyke Lead Mill. 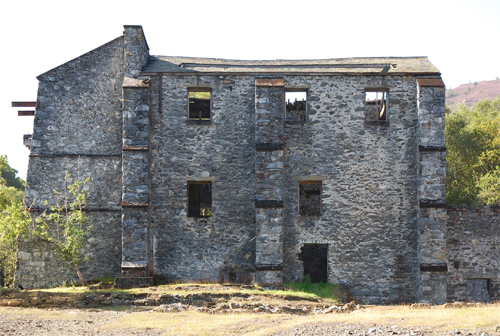 This is a large upstanding building, possibly the largest upstanding building associated with lead mining in Gwynedd. One small area of collapse had recently occurred on the east wall of the turbine house, though the remainder of the wall appeared to be relatively stable. Despite the height of the walls, the remainder of the building also appeared to be relatively stable, and it is the timber work that once supported the roofs, floors and machinery that is at greatest risk. Unfortunately the slow rotting of the timbers will have a direct impact upon the masonry, which will be dislodged by falling timbers, and in danger of collapse where wooden lintels occur. A full record of this structure, to include the masonry and timber elements, was therefore required, to be undertaken by measured survey using a reflectorless total station and photography. Cn 326 Hafna Lead Mine Mill. Cn 327 Vale of Conwy Lead Mine. Cn 331 Afon Llugwy Lead Mill. The site contains a mill building standing to eaves height, with foundations of contemporary structures alongside. North of the mill are two tall stone piers, one on either side of the river, and a level into the mine. A timber lintel on the east side of the mill has rotted, causing the north-east corner of the building to slip and start to collapse. This will fall in the near future if no remedial work is undertaken. It is therefore proposed to record in detail the north and east sides of this building. Cn 332 Coed Mawr Pool Lead Mine. The scheduled area forms one of the principal dressing floors of a much larger mine site that lay dispersed around Llyn Pencraig. Several structures lie within the scheduled area, including a substantial wheel pit, a bob pit, a circular powder store, and various lengths of upstanding walling. A part of the wheel pit, particularly the south wall, is eroding, and the other structures, mostly of dry-stone build, are also very vulnerable to collapse. No detailed plan exists of the location of all the masonry structures. It was proposed that this site be surveyed in its entirety using a total station, with each feature to be recorded by photograph and written description. The wheel pit, bob pit and powder store was to be recorded by measured survey. The project began in 2006-7, and initial photographic surveys were undertaken. It did not prove possible, however, to undertake the surveys within that financial year. The recording programme was therefore completed during 2007-8. Final drawings have been compiled from the digital surveys, and a report on each of the three sites has been completed. The reports include copies of the digital surveys, relevant examples of the photographic record, and a textual description.